Many venues ceilings are far from being desired! 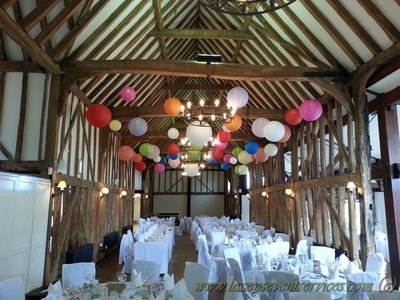 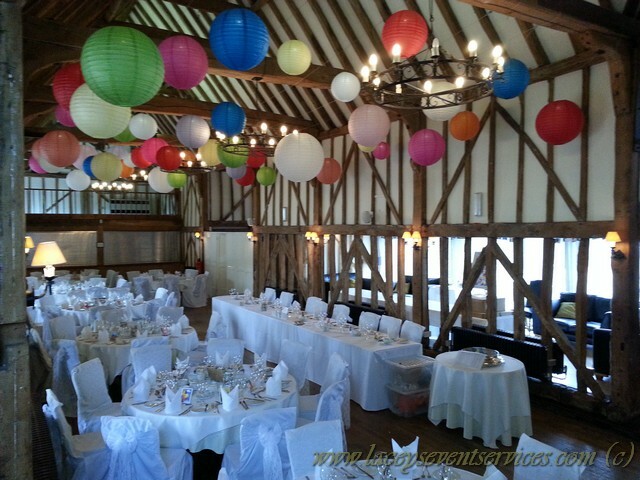 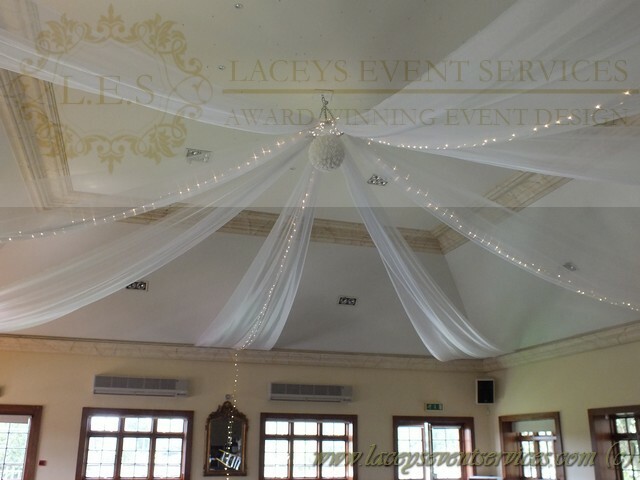 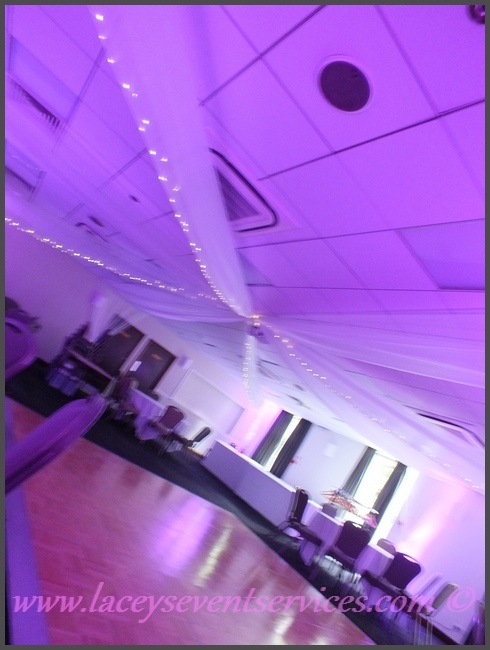 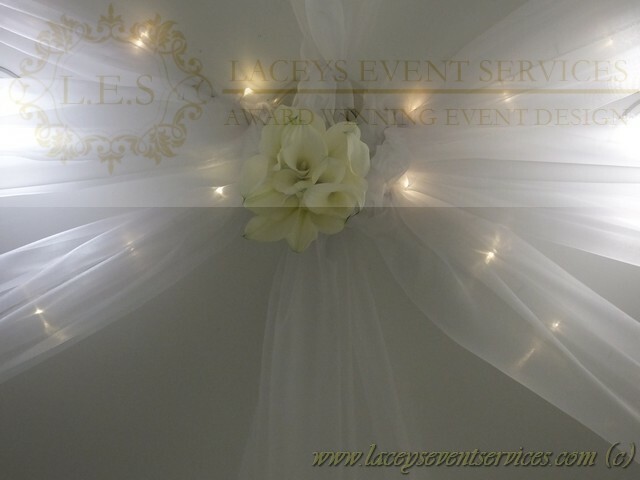 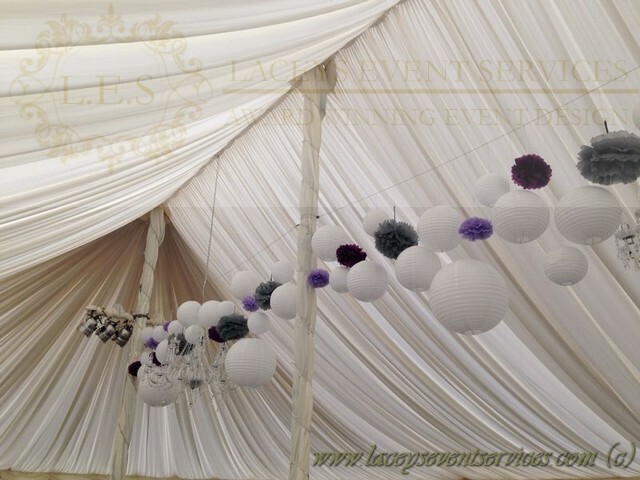 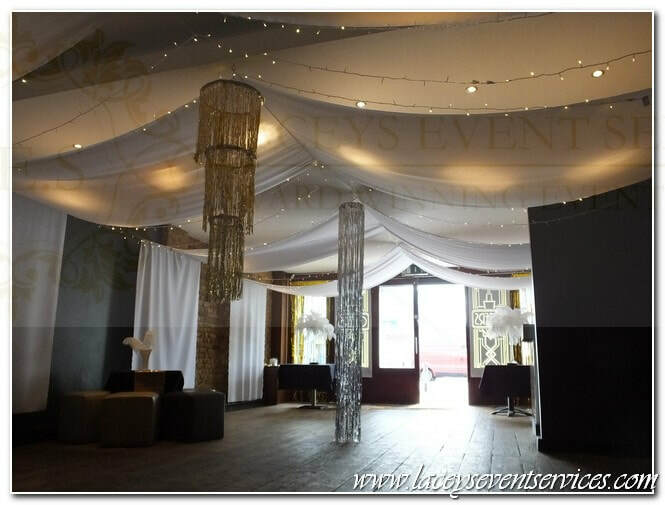 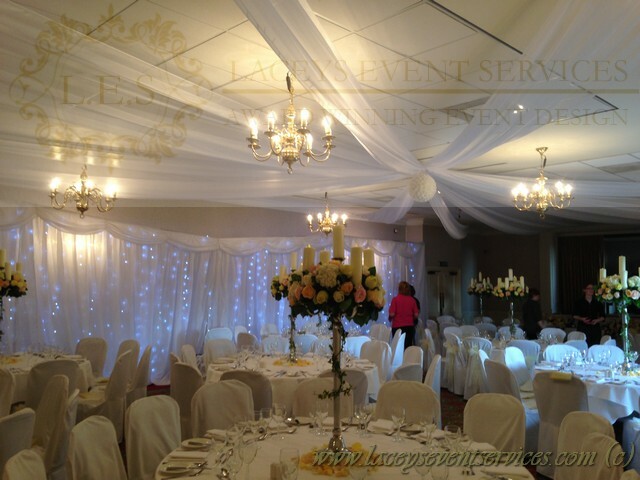 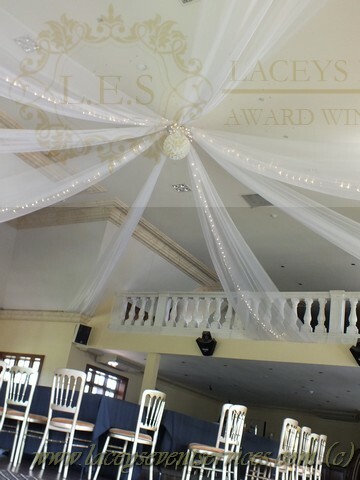 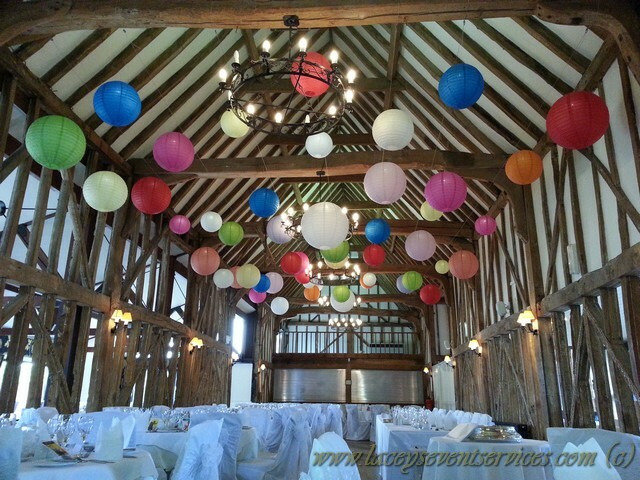 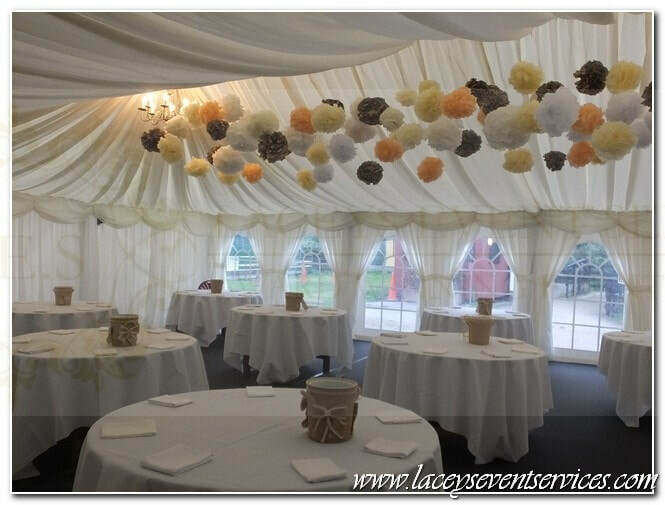 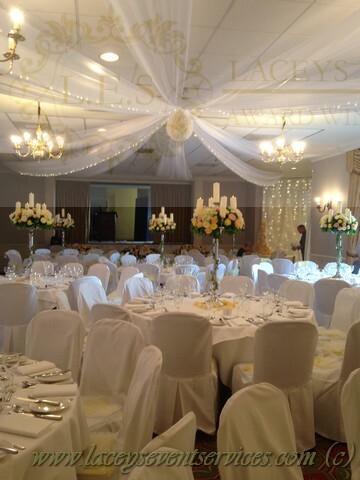 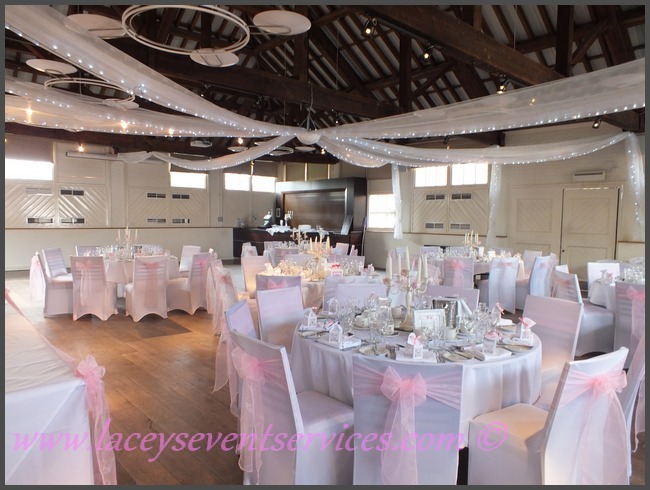 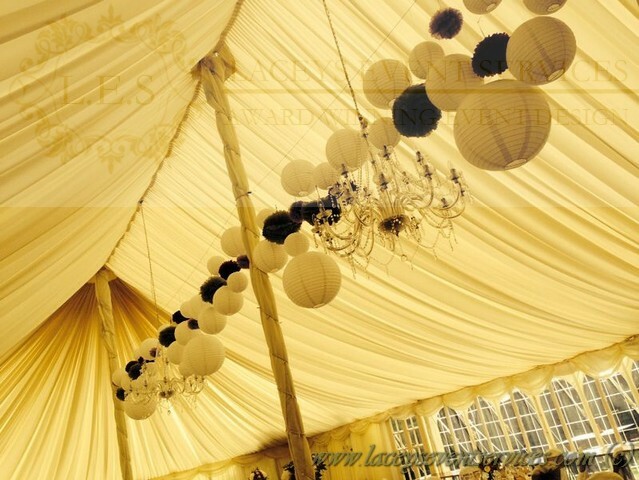 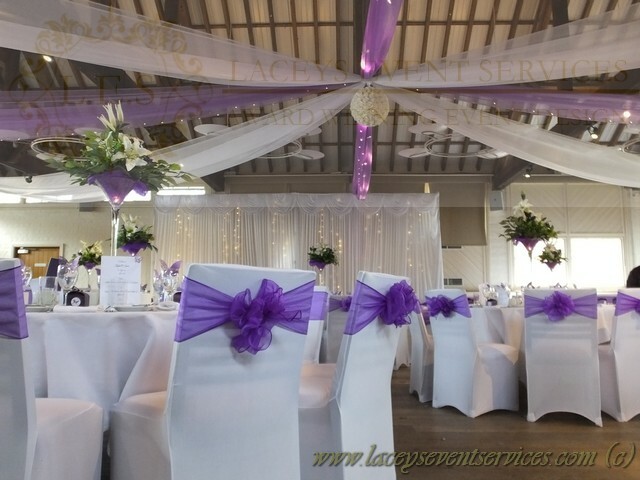 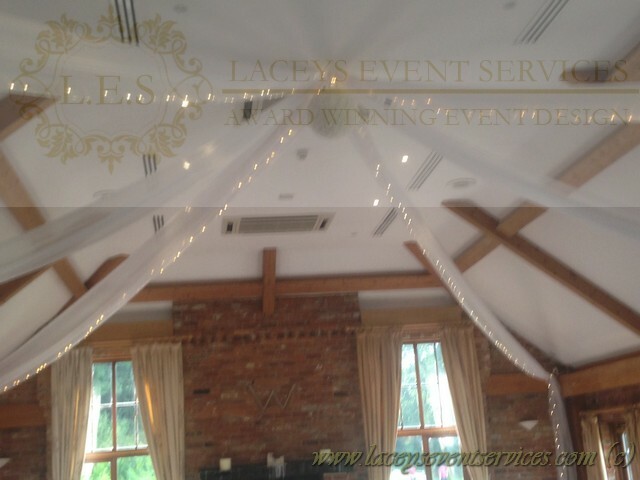 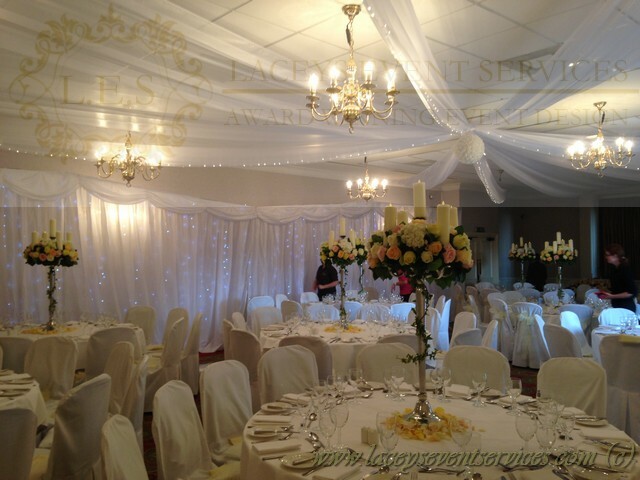 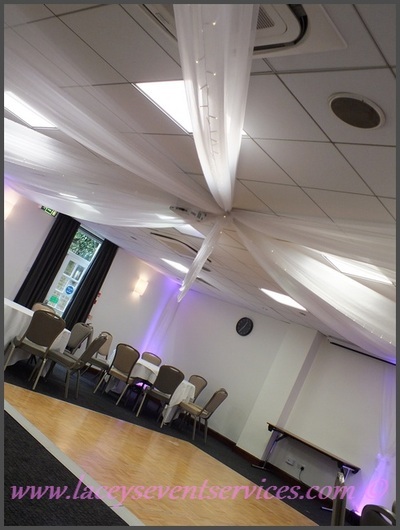 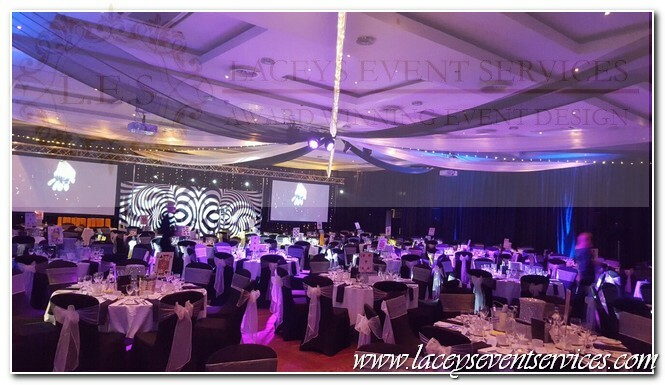 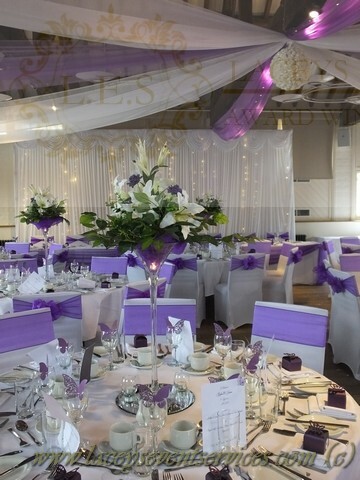 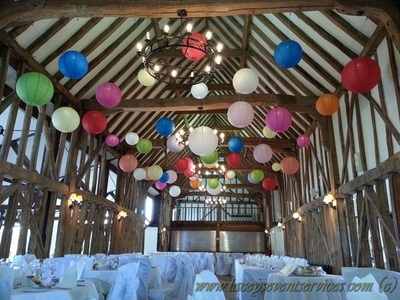 We stock and fit a wide range of ceiling decorations including ceiling swags, fairy lights, paper pom poms, Chinese lanterns, rose pomanders and voile ceiling canopies to ensure your ceiling doesn't fall short from the styling of the rest of your venue. 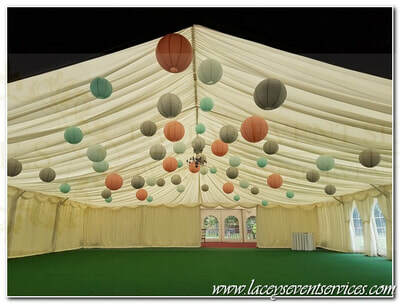 Below we have detailed some popular options. 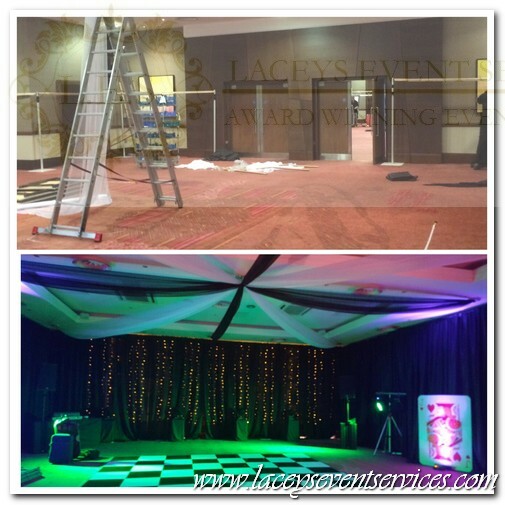 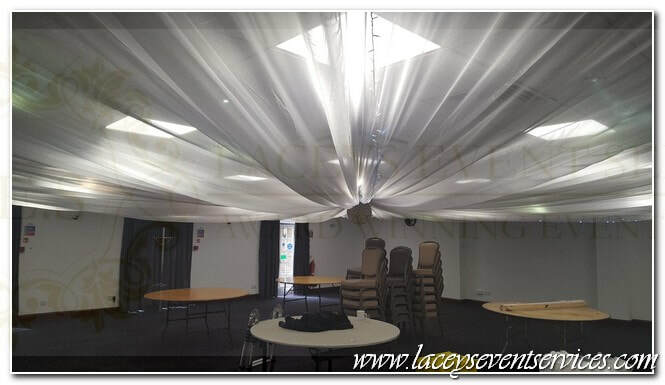 All ceiling canopies can be attached using either staple gun or strapping directly to your venues existing fixtures. 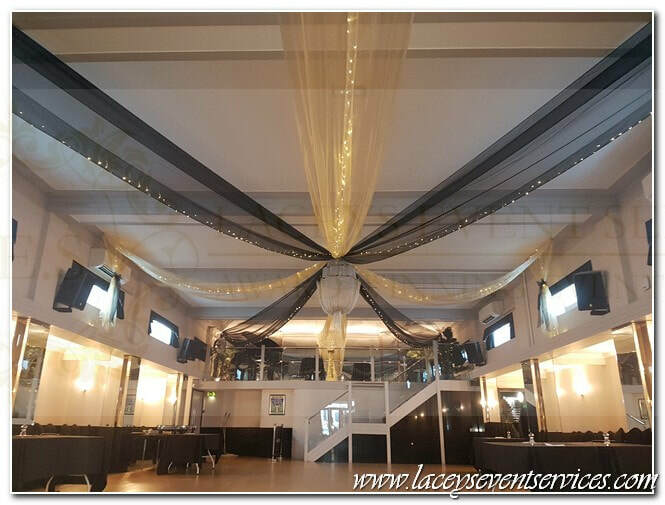 We have been fitting ceiling canopies in London and Essex for over 10 years and our ceiling canopy team are fully trained in working at height, IPAF & PASMA. 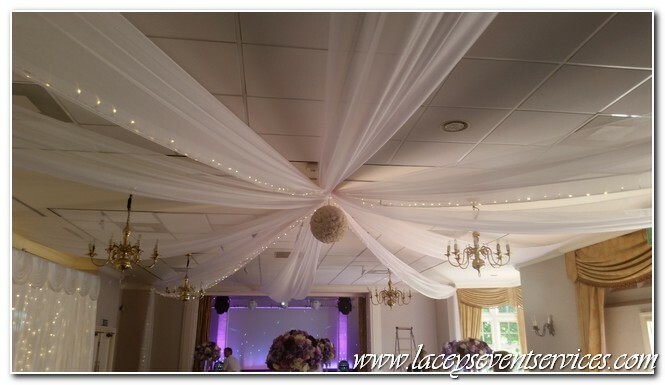 We also have £10 million public liability insurance so you can rest assured your in the best hands when booking your ceiling canopy & ceiling decorations with us! 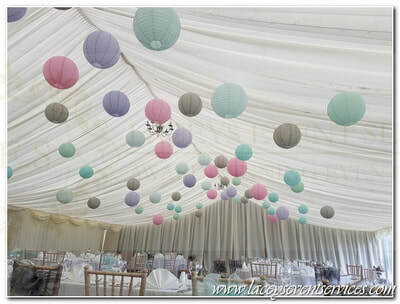 Chinese Paper Lantern Canopies are great for adding a splash of colour or even subtle lighting to your wedding venue ceiling! 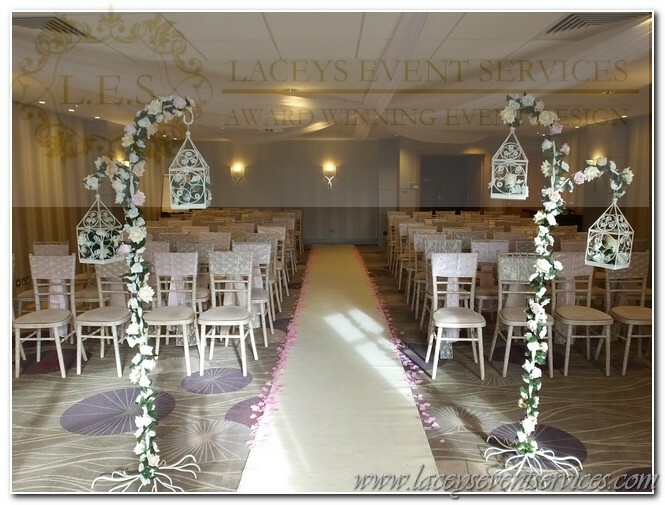 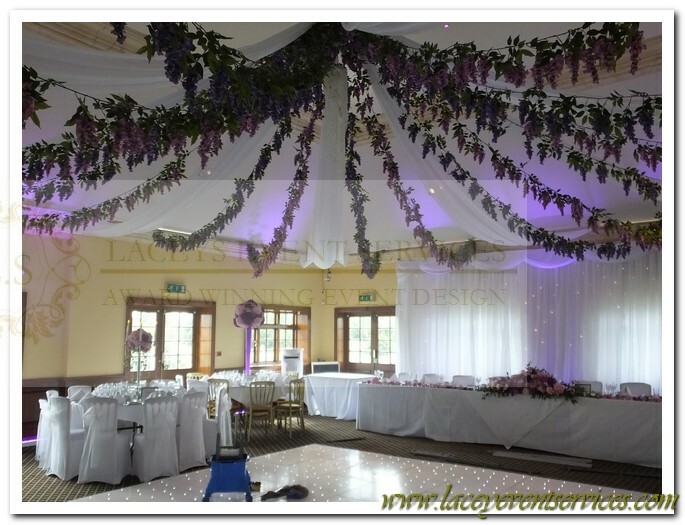 One of my personal favorites in way of Wedding Ceiling Decoration and Canopies is our Flower Garland Canopy! 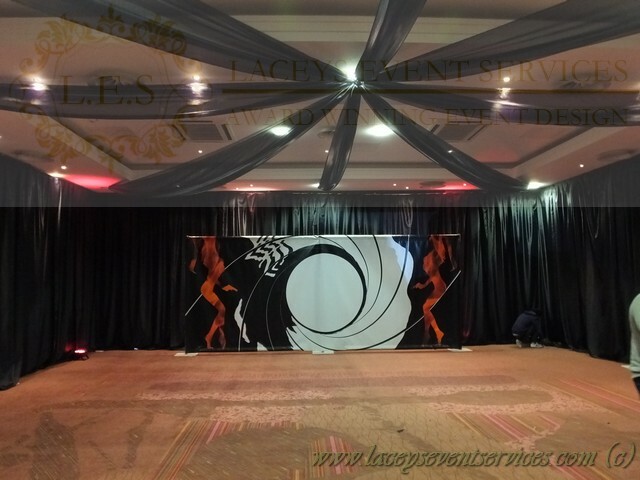 This canopy really gives the WOW factor with Venues and Clients alike being left speechless at the final outcome! 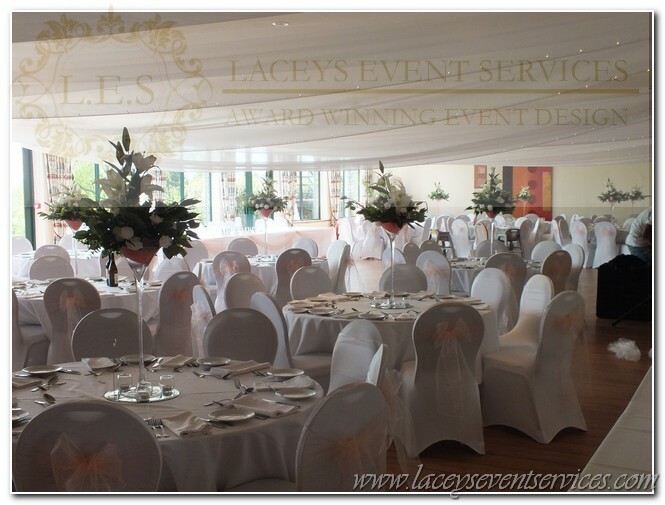 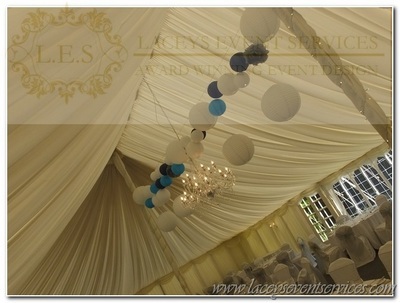 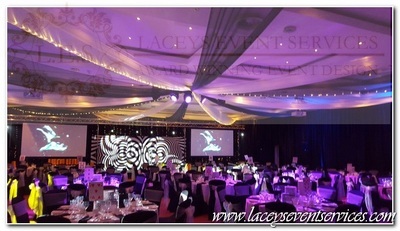 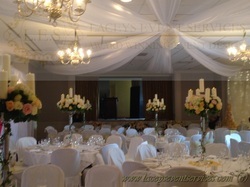 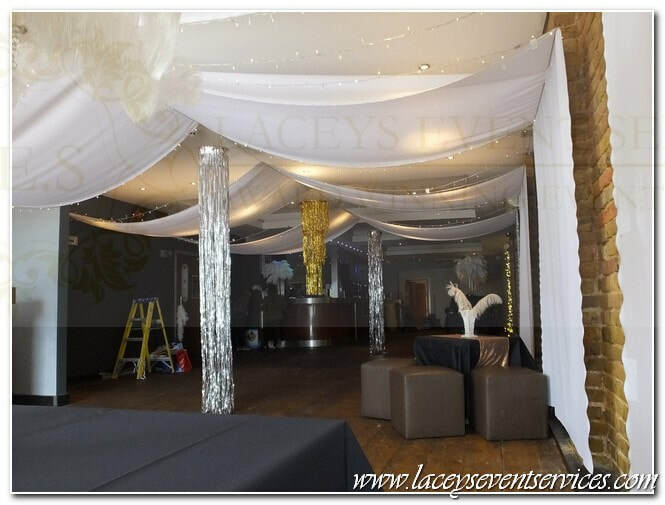 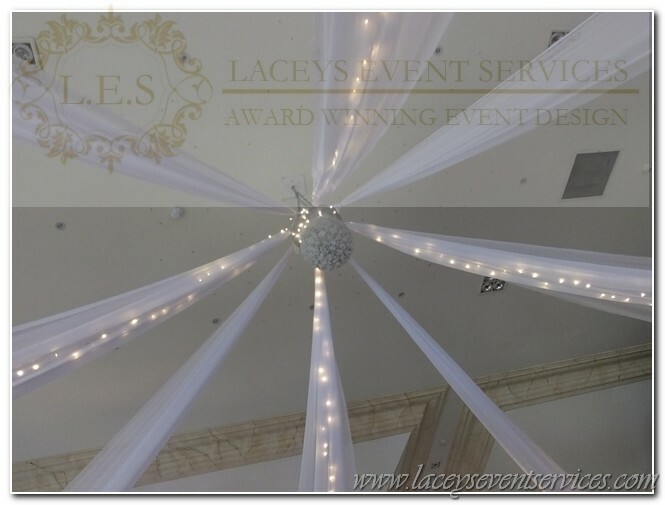 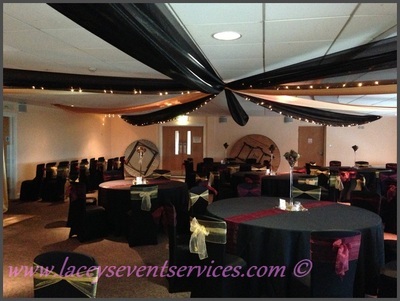 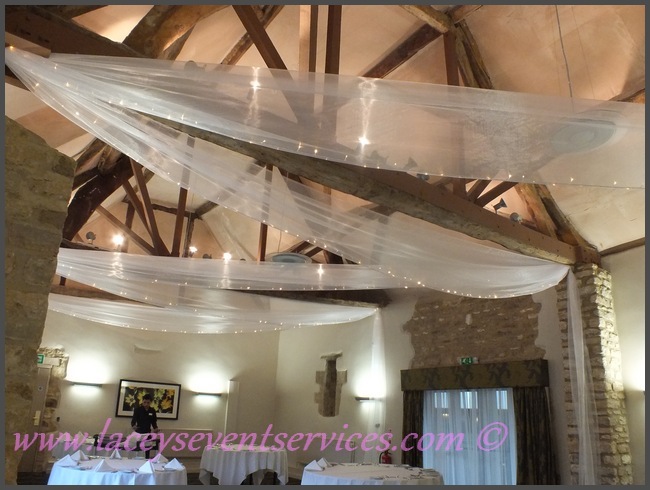 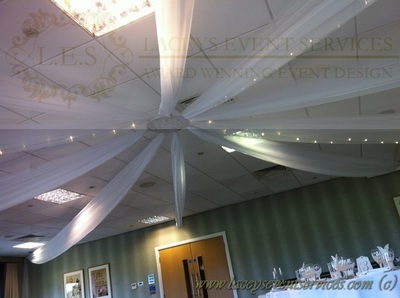 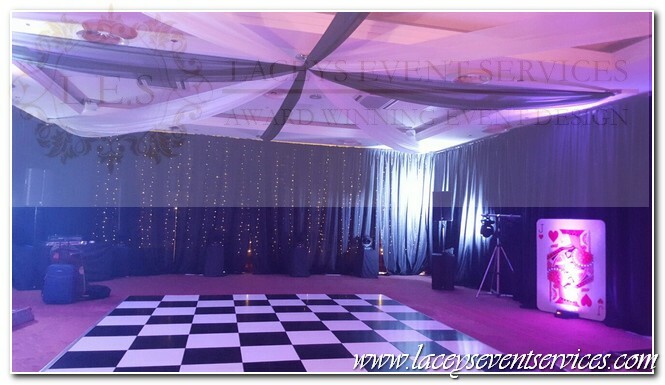 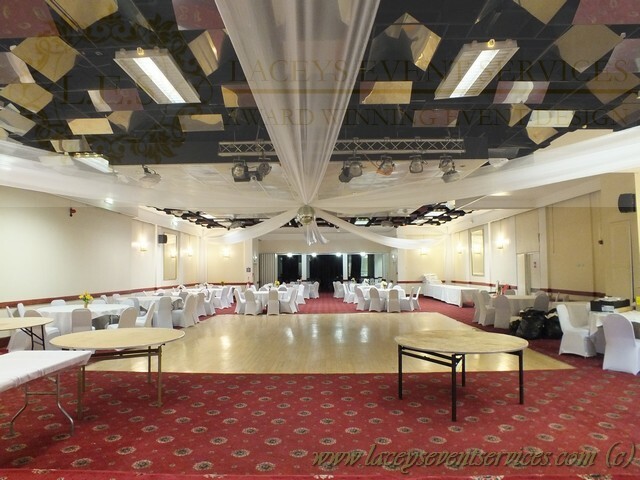 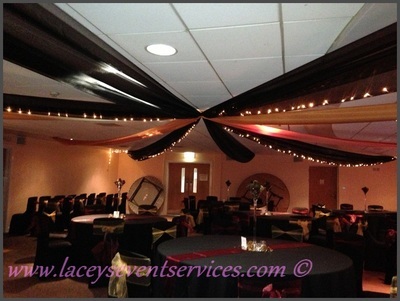 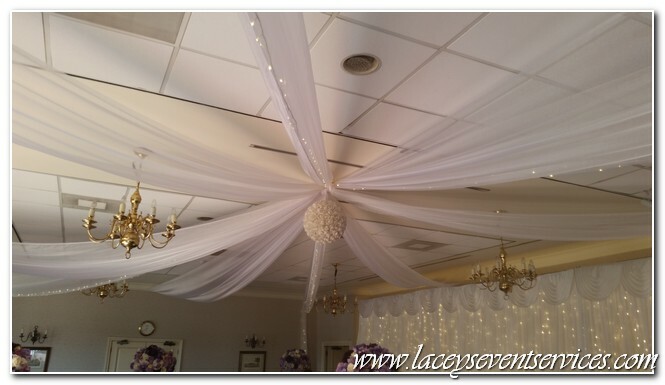 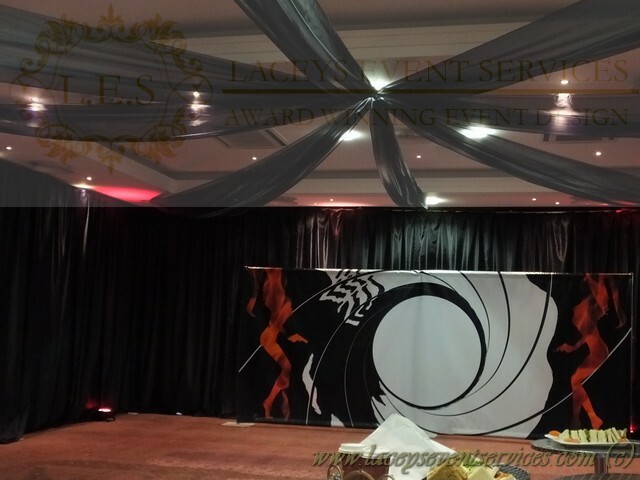 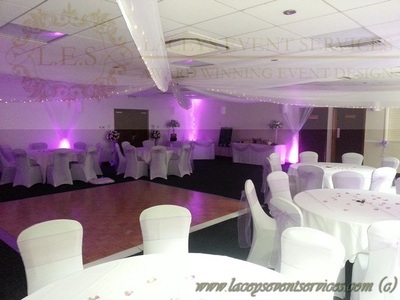 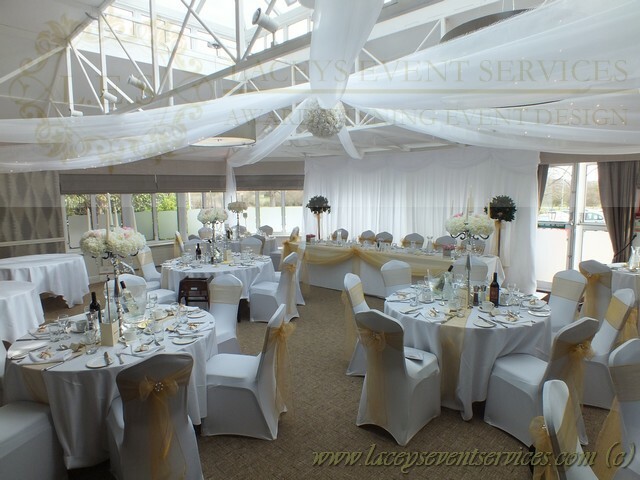 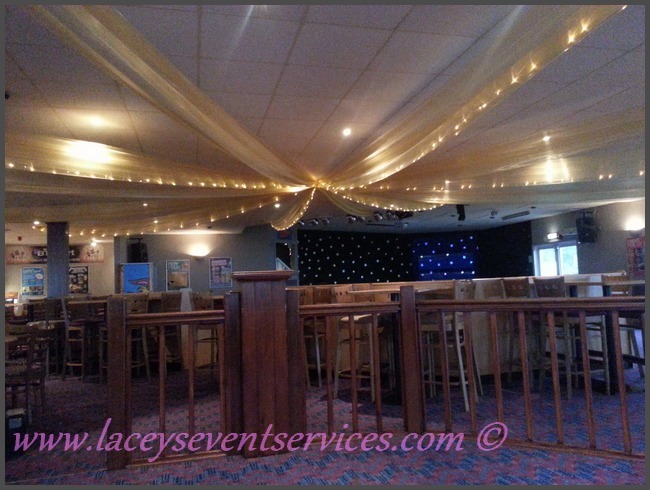 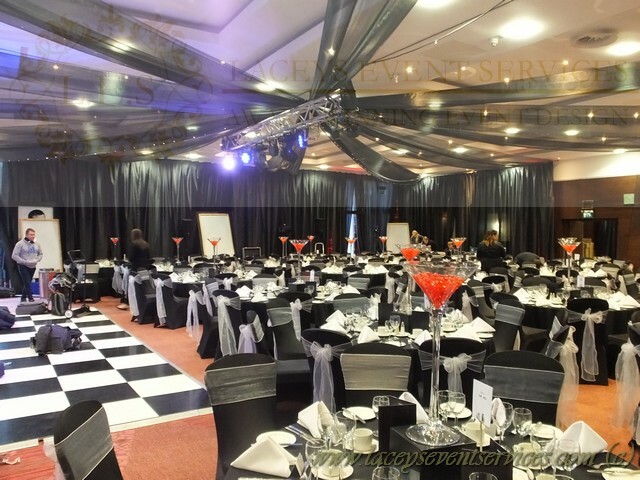 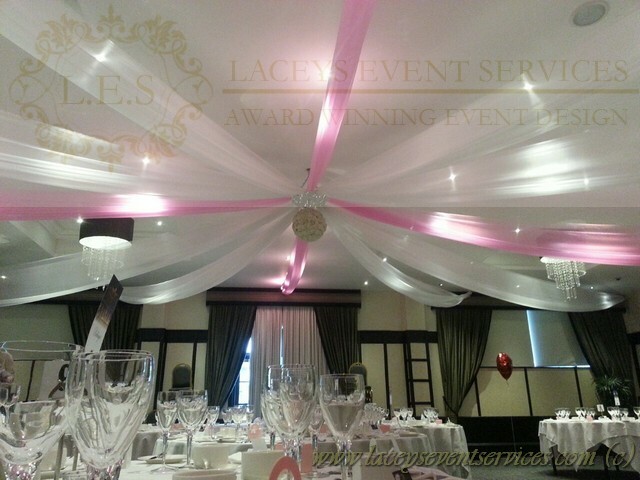 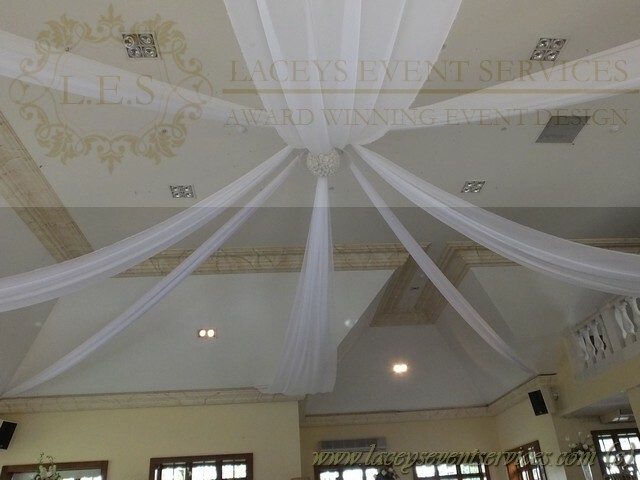 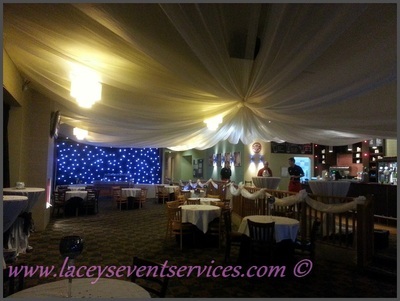 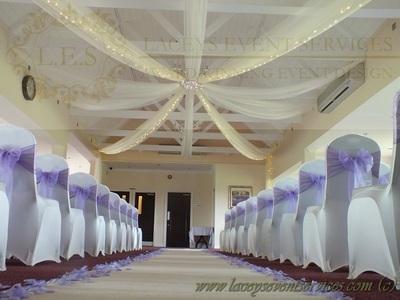 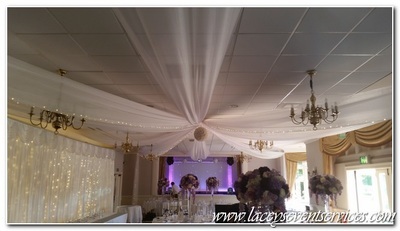 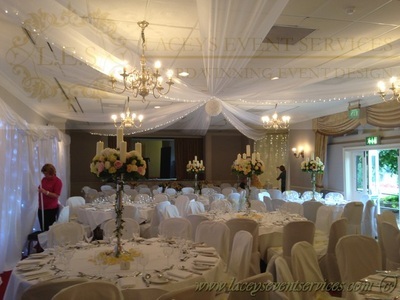 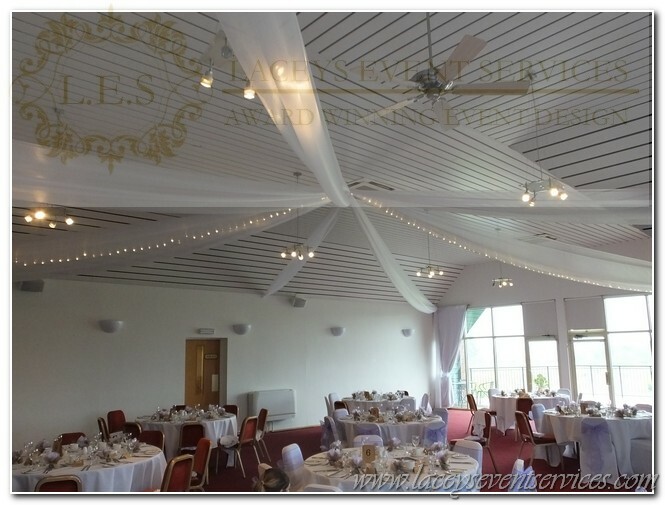 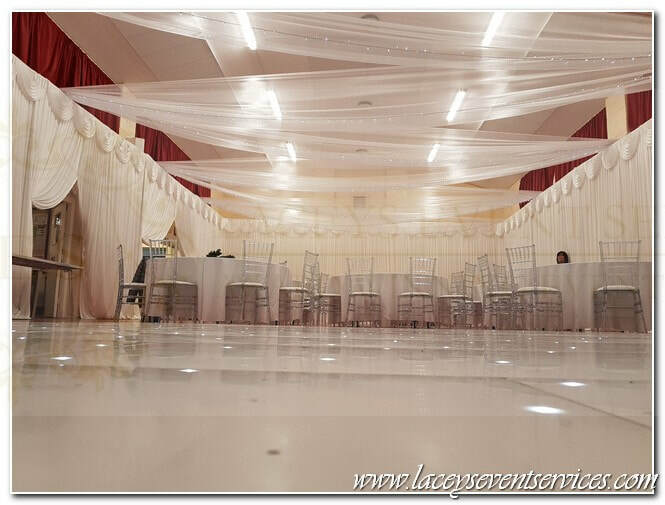 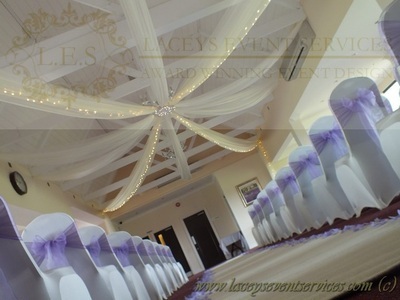 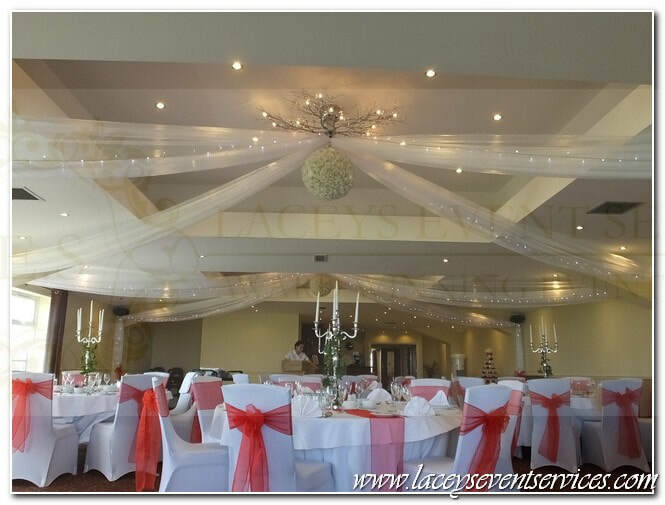 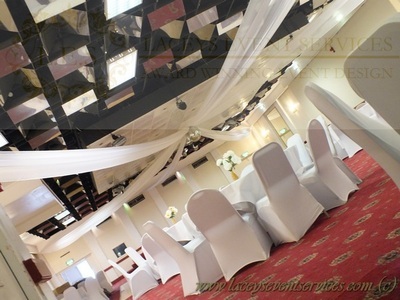 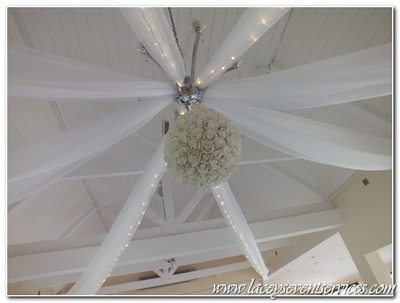 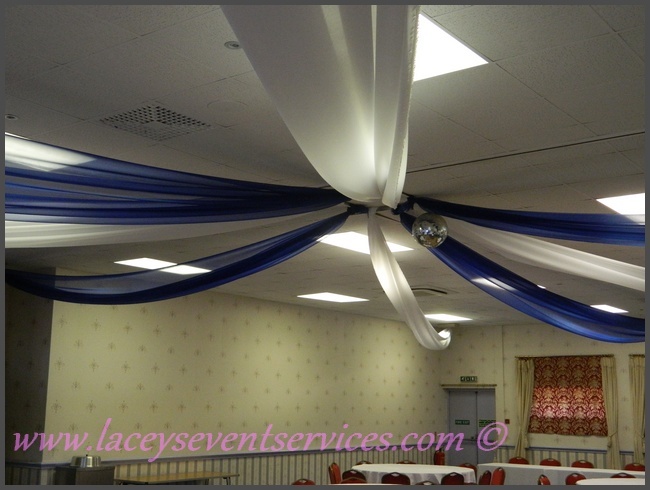 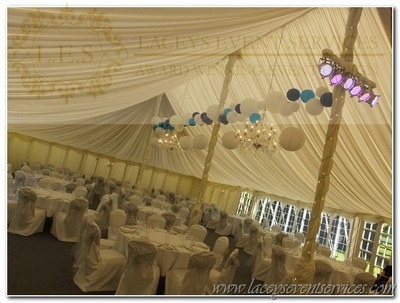 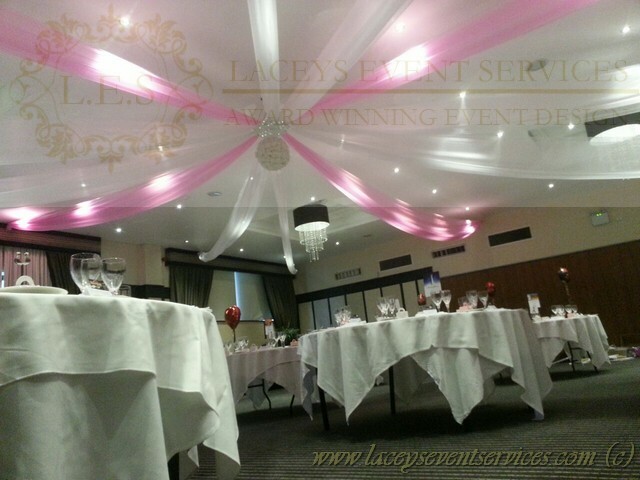 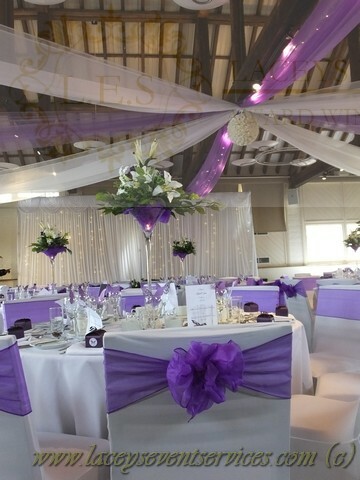 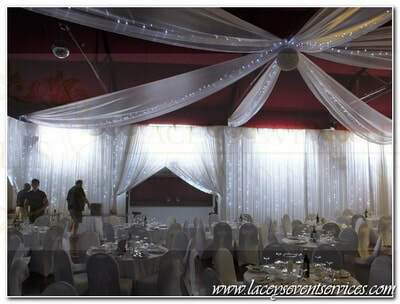 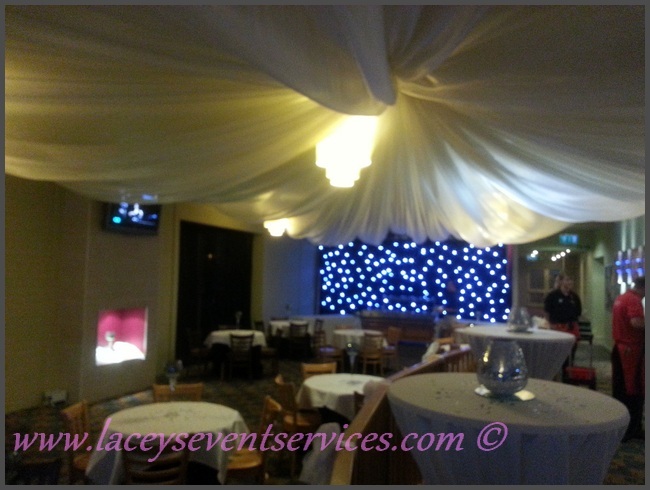 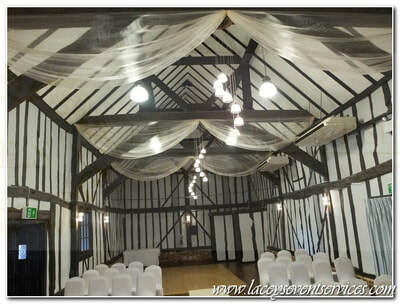 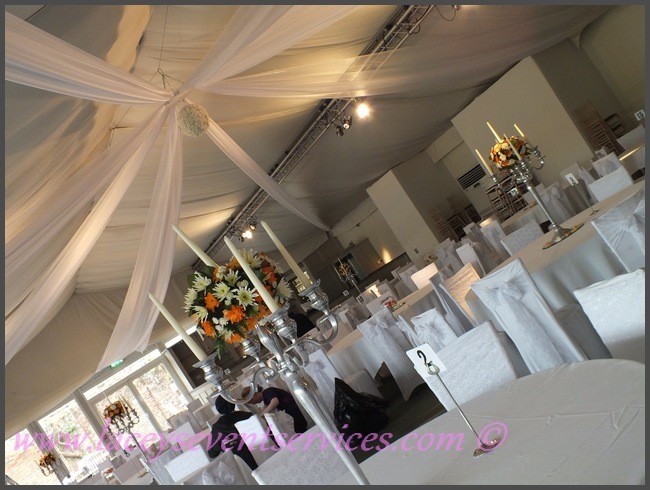 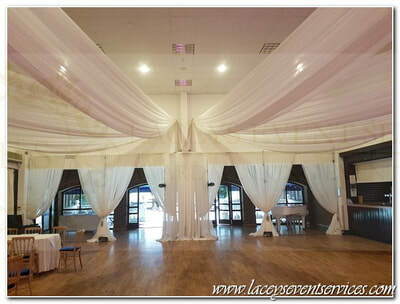 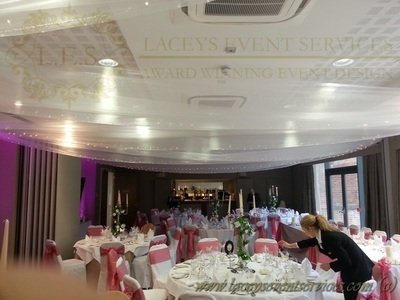 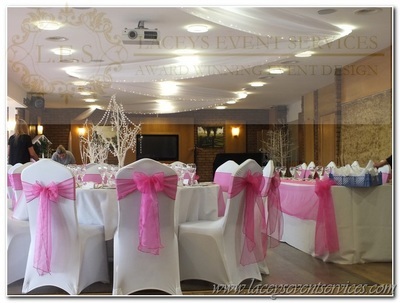 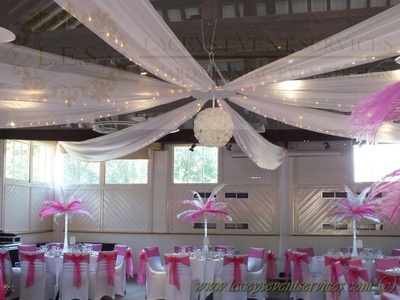 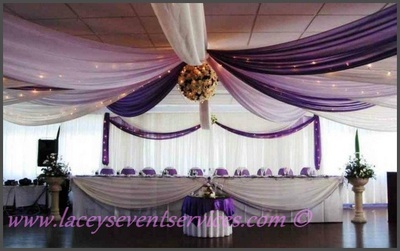 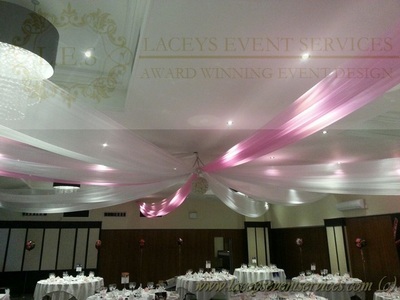 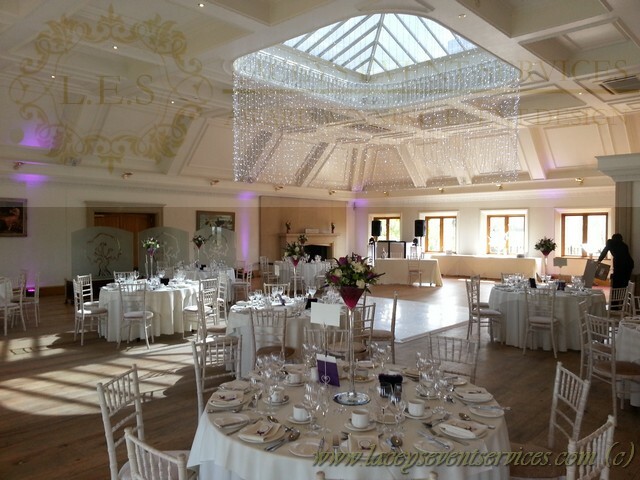 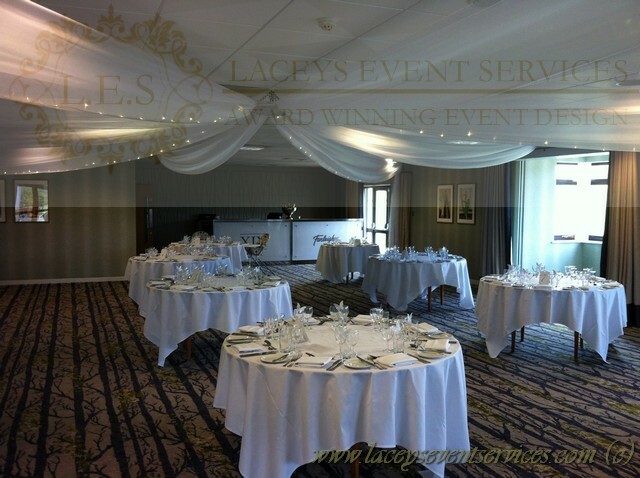 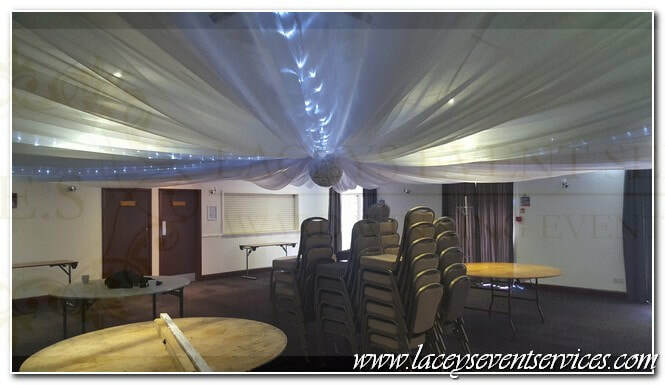 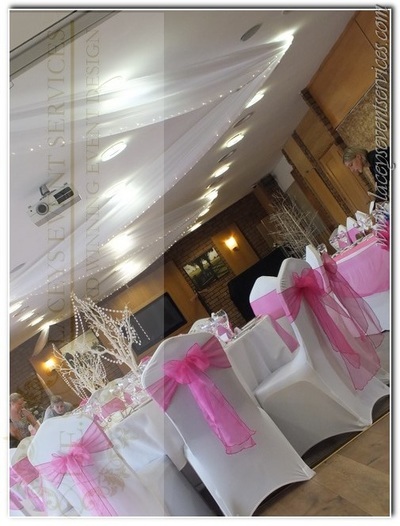 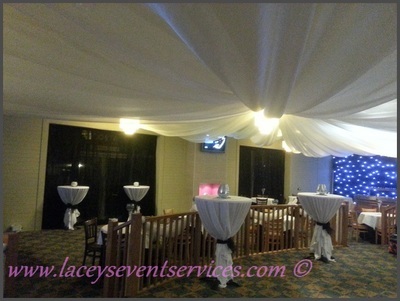 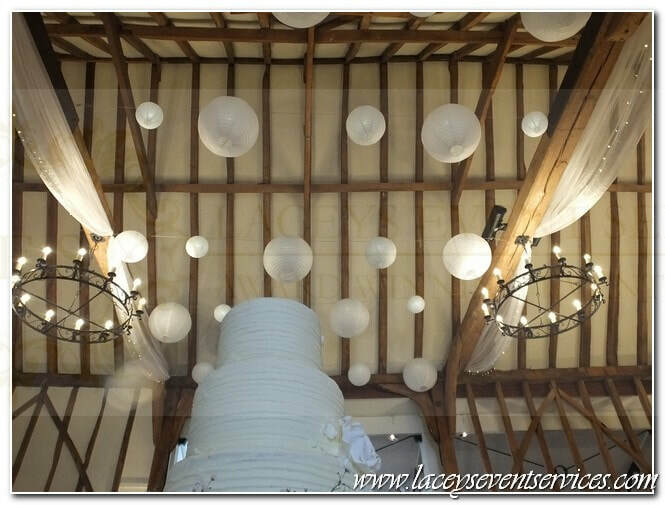 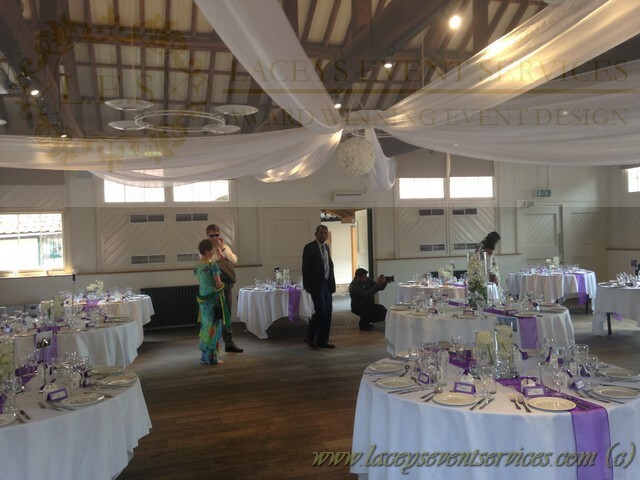 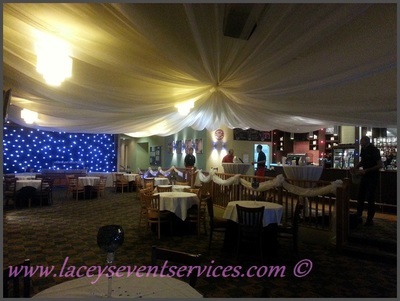 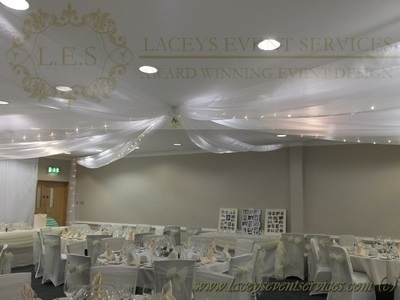 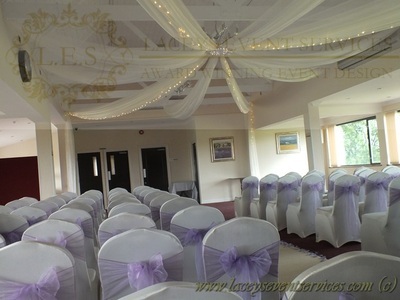 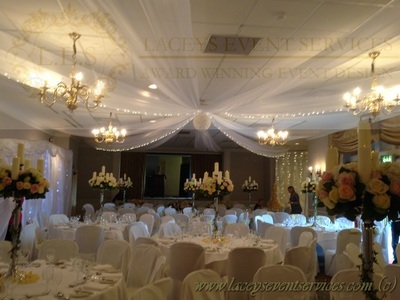 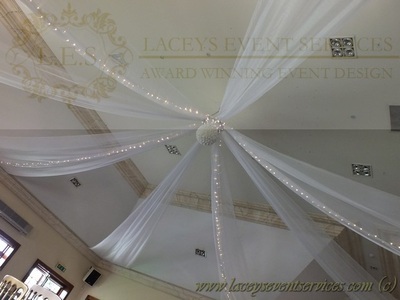 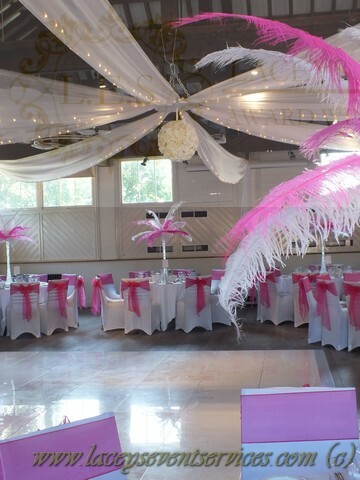 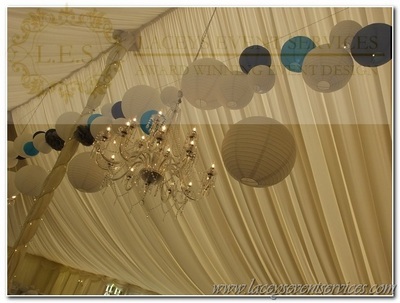 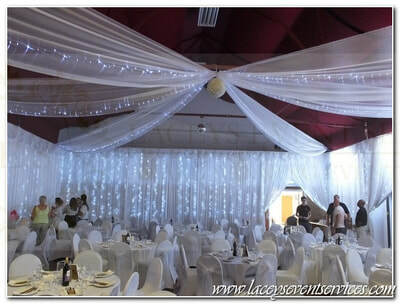 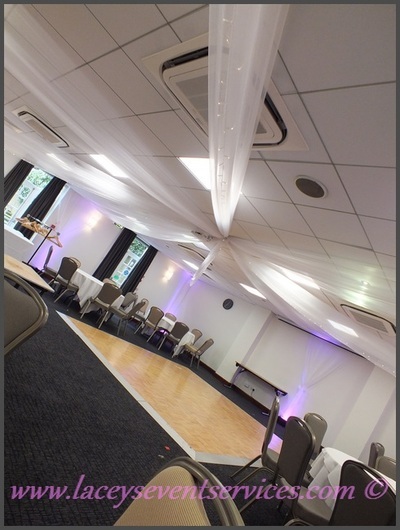 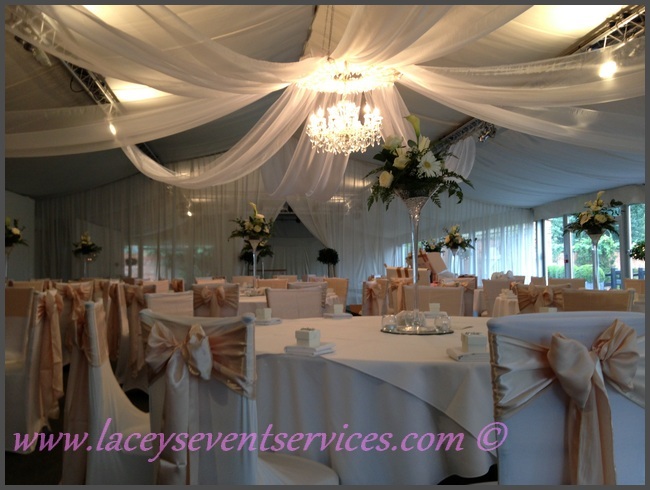 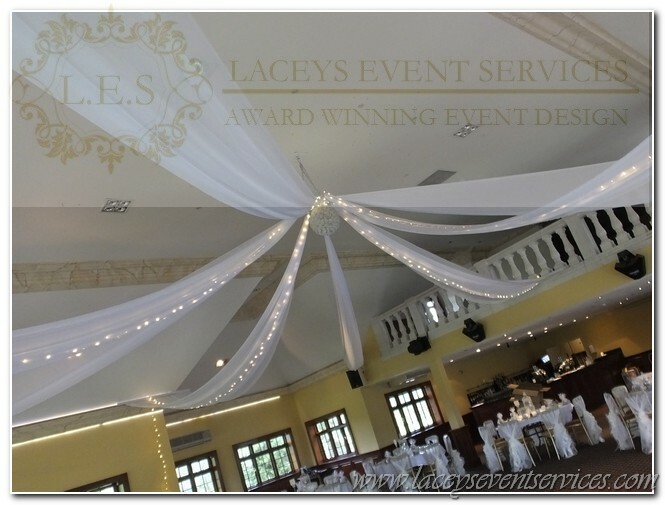 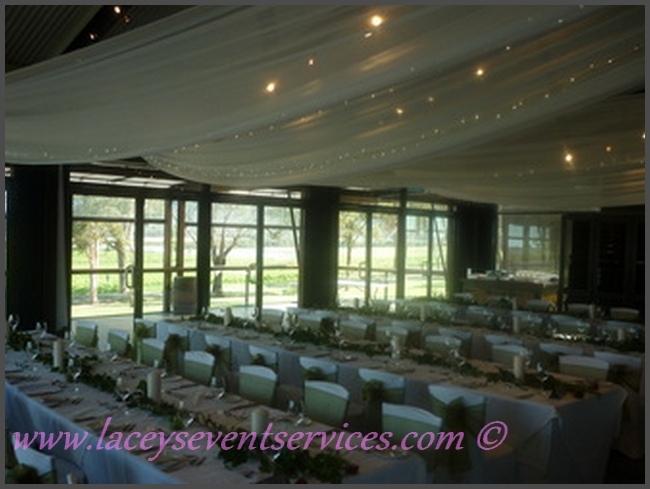 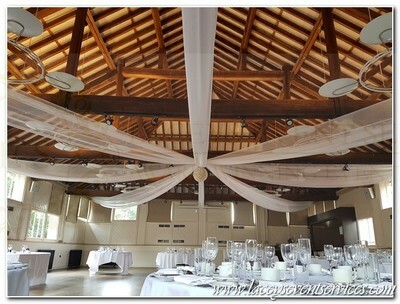 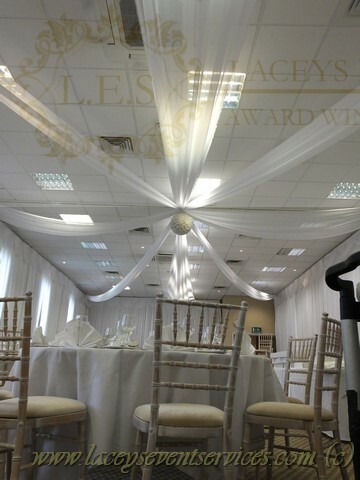 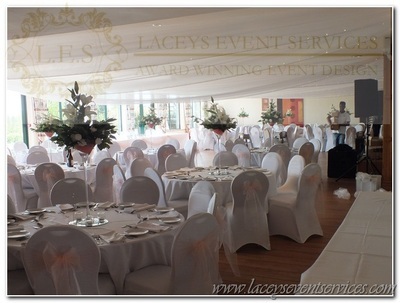 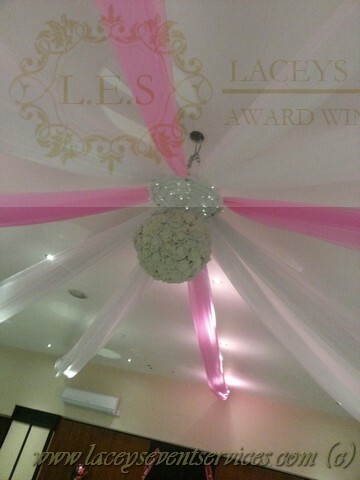 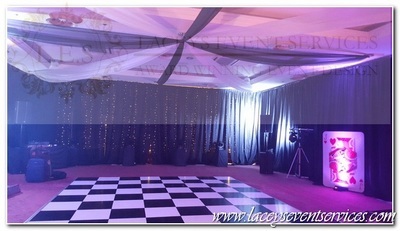 Currently a very popular way to decorate a venues ceiling is by using a fan style ceiling canopy. 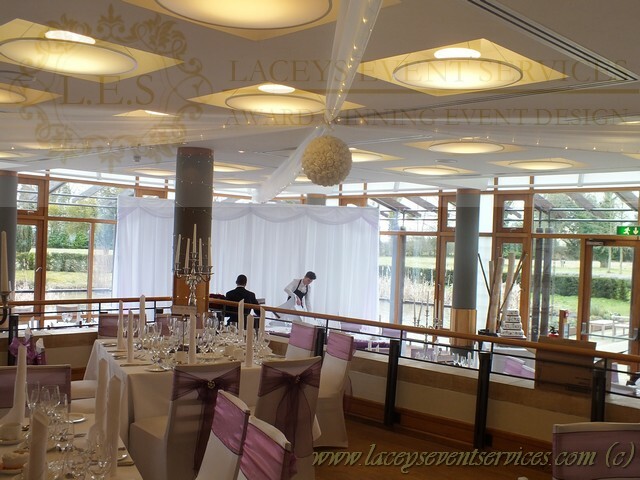 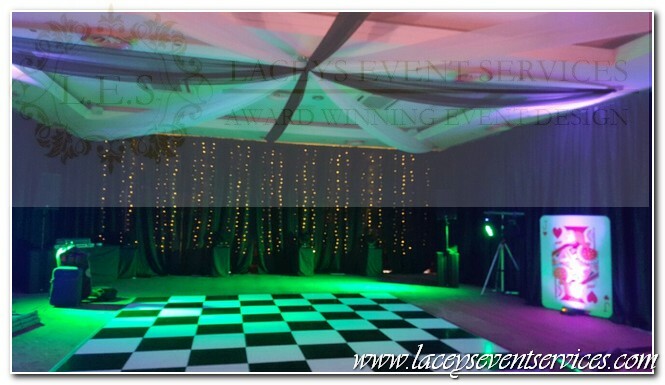 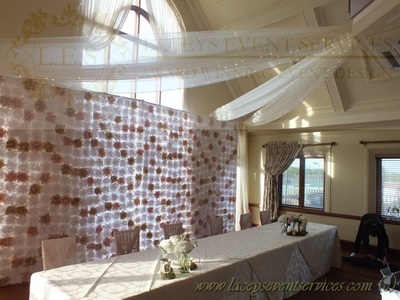 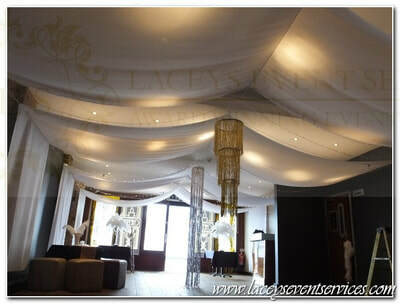 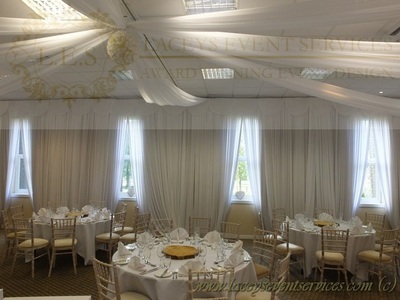 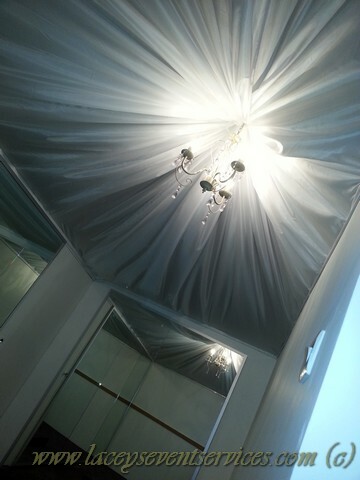 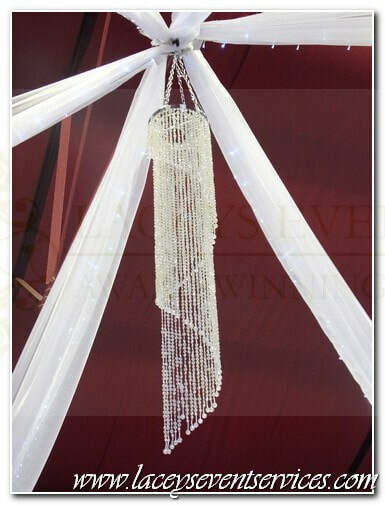 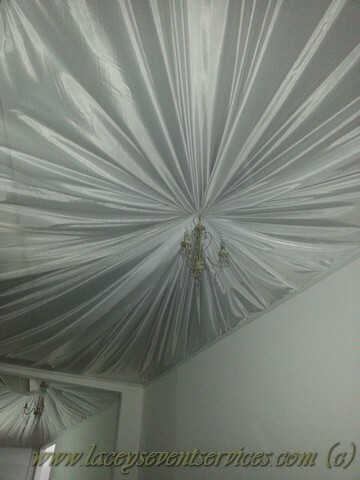 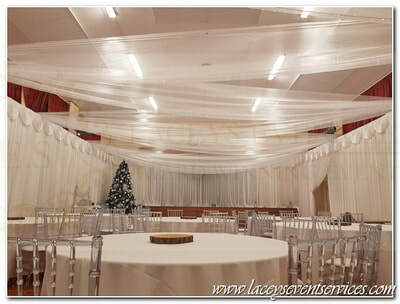 The ceiling canopy is made from a voile fabric and can be provided in any colour. 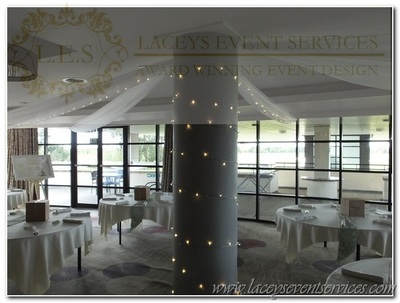 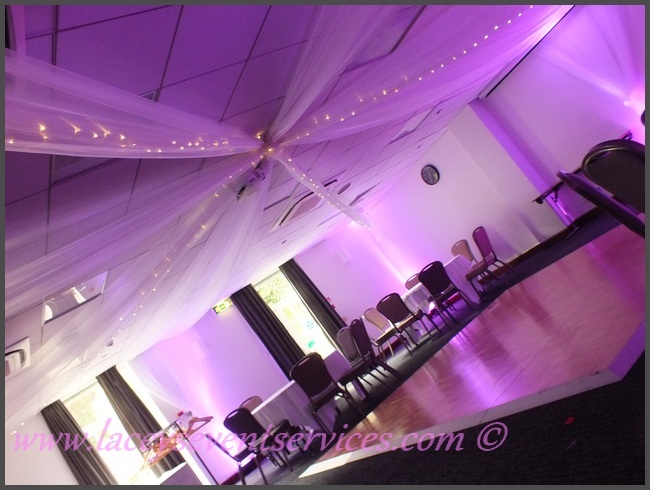 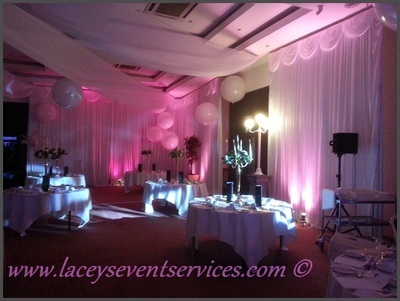 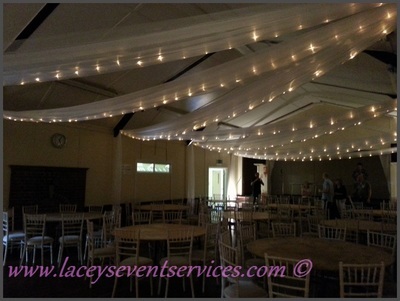 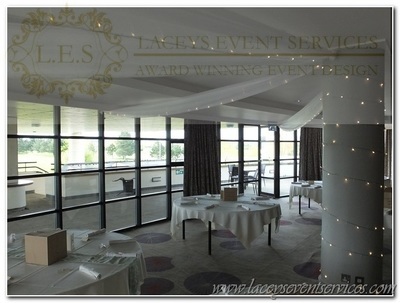 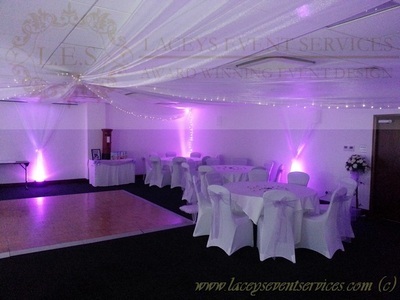 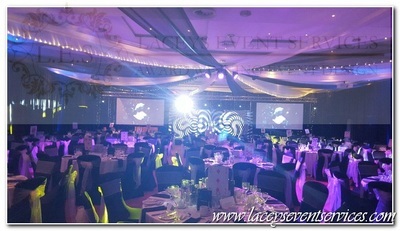 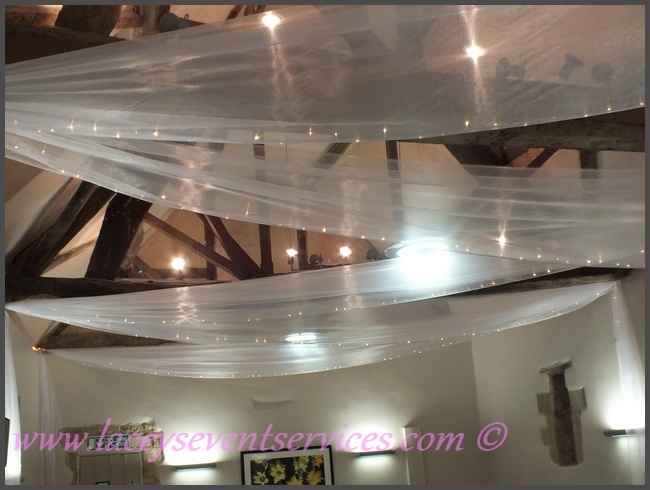 Fairy lights can be added to the ceiling canopy to set ambience and mood lighting as the evening draws in. 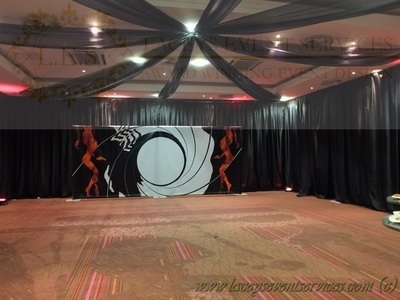 We will require your room dimensions (Length x Width x Height) to quote. 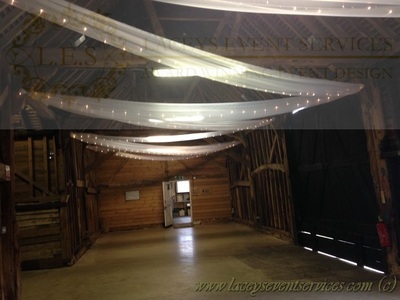 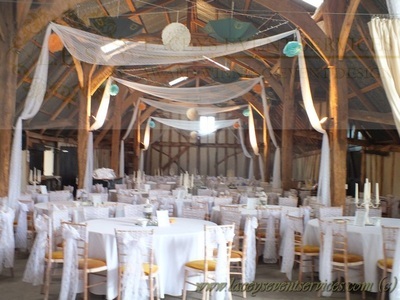 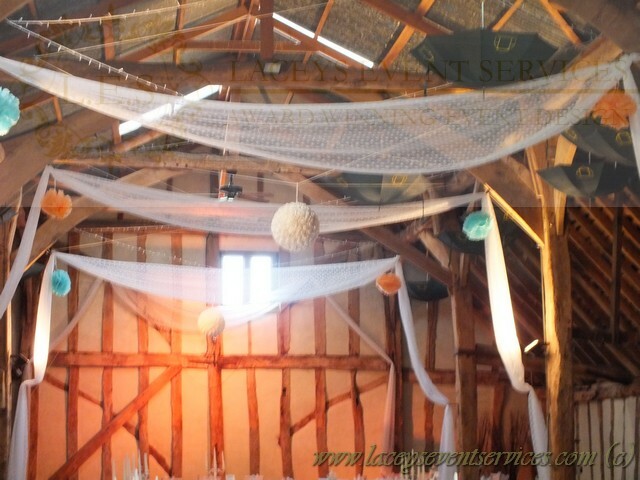 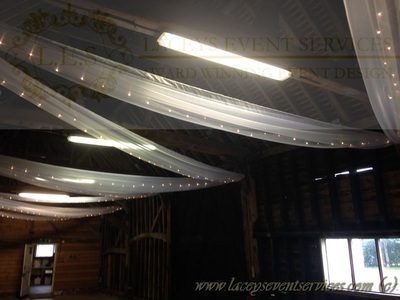 Ceiling swags are a very popular option for barns and pitched roof venues. 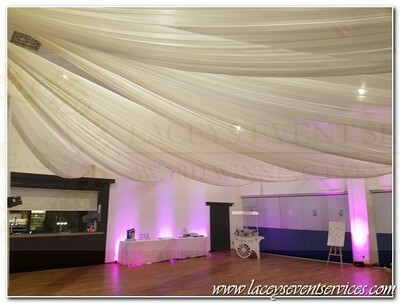 As with the fan style ceiling canopy they are made from a voile fabric which is available in most colours. 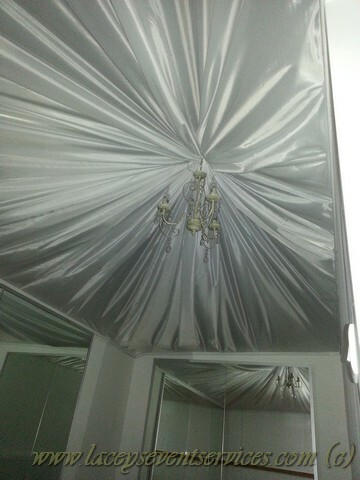 Each swag drapes from one side of the room to another in either a parallel or zig zag notion. 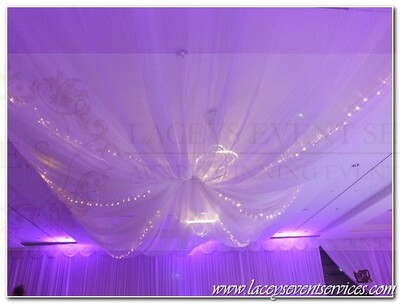 Optional fairy lighting can be added and streams from the canopy to floor at each end point. 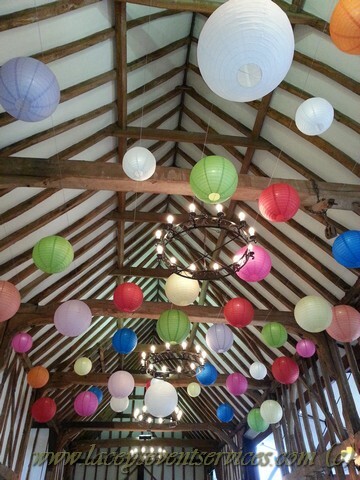 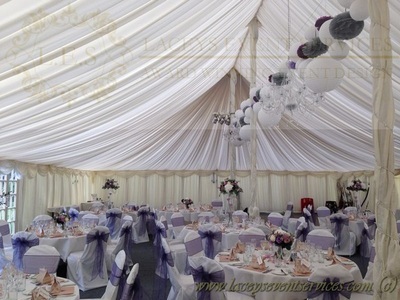 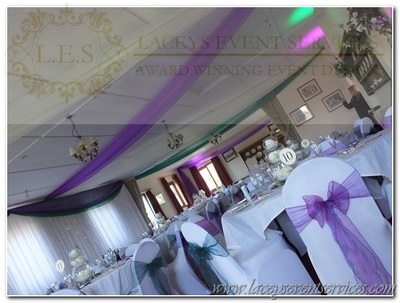 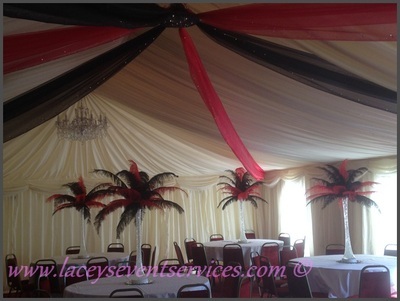 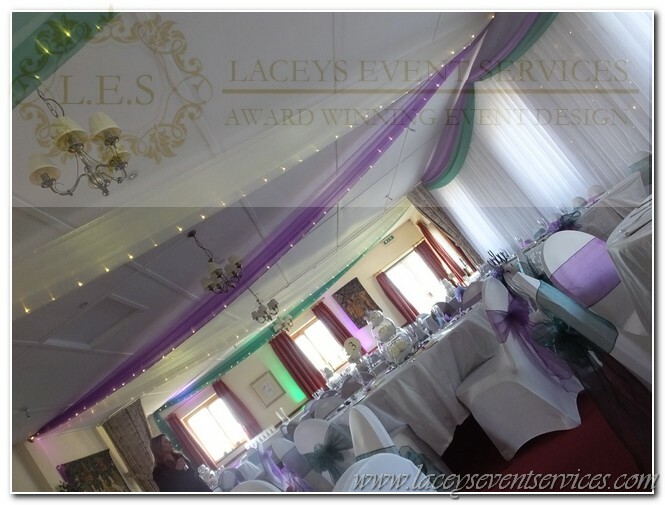 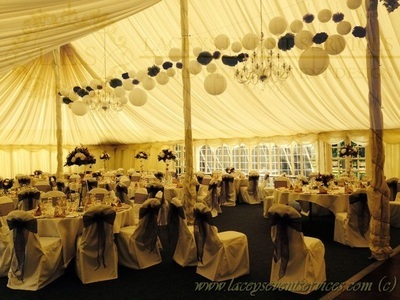 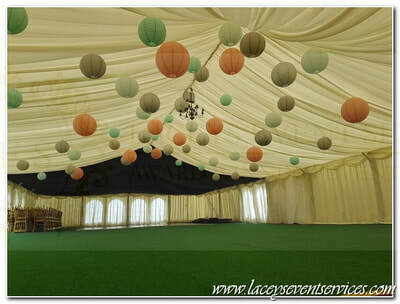 A great way to add a splash of colour to your plain marquee is with our coloured ceiling strips! 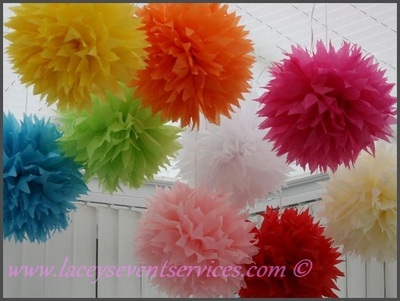 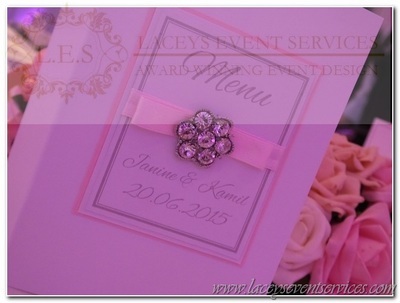 Available in any colour to match your event theme! 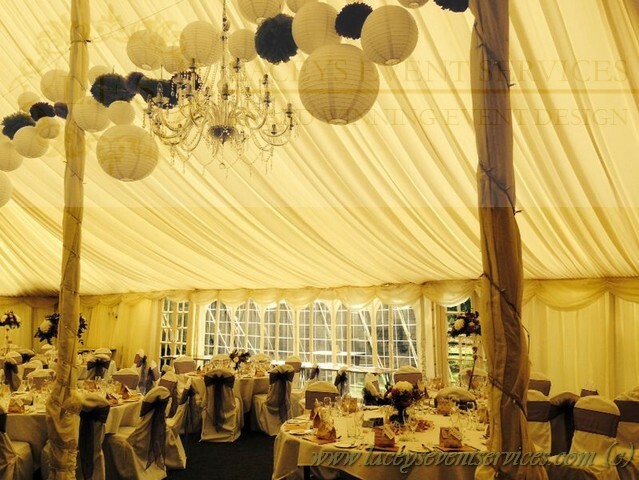 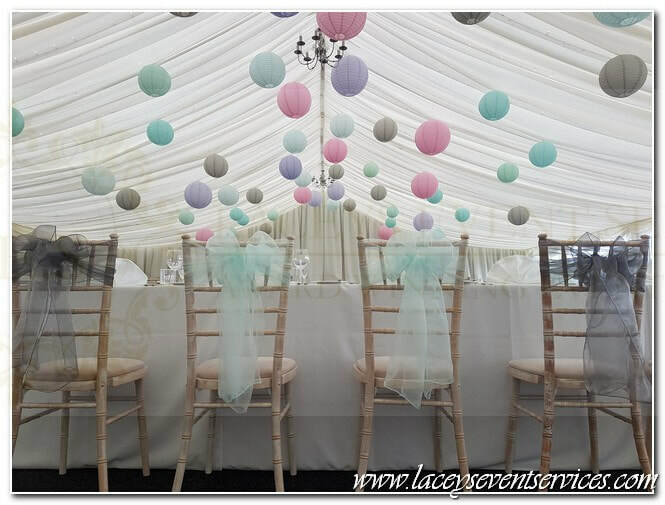 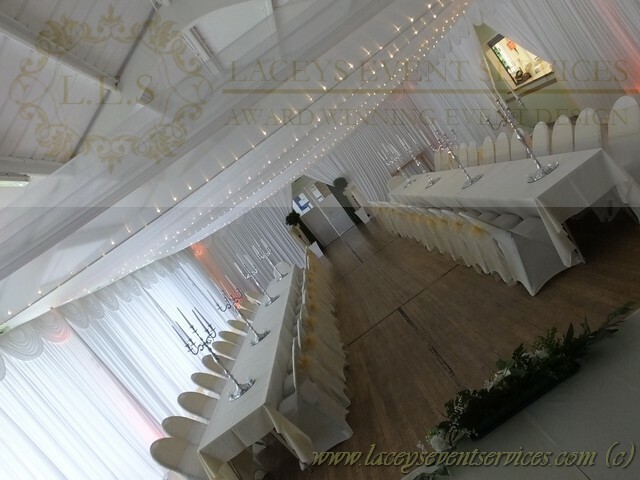 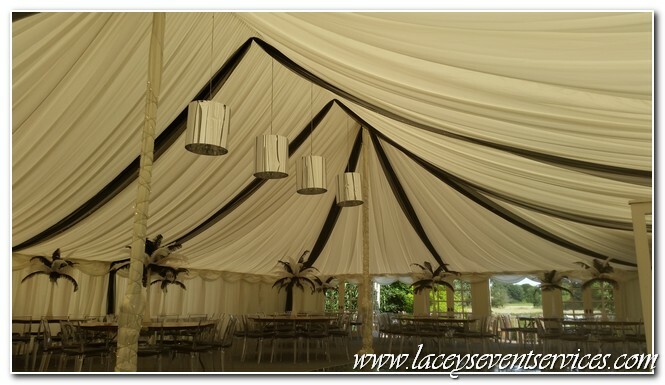 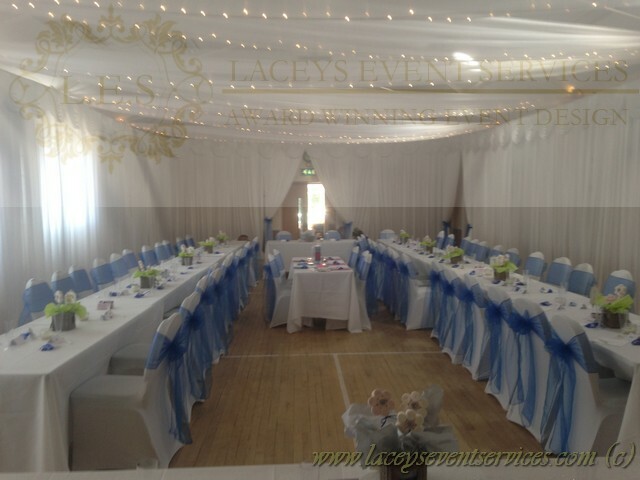 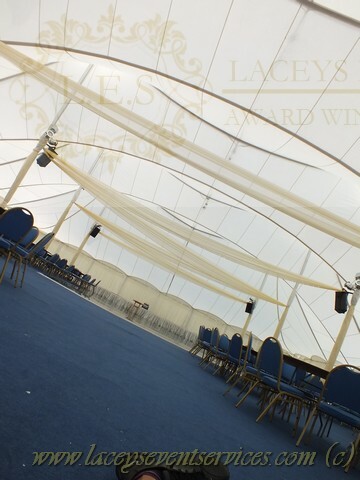 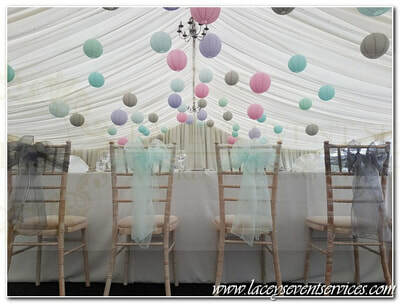 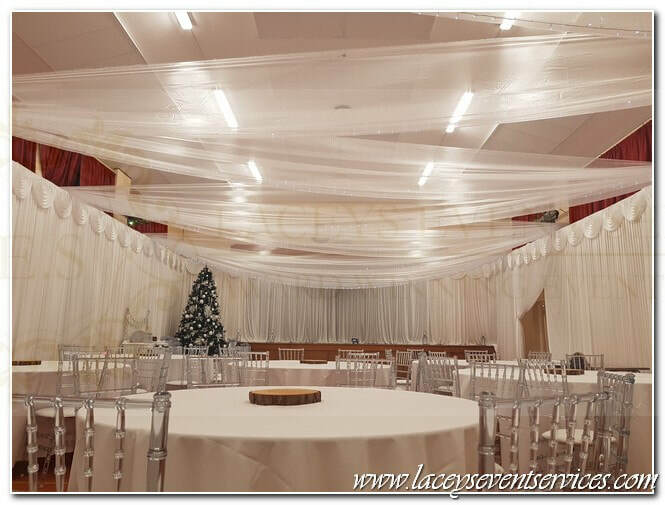 We can also arrange for complete coverage ceiling canopies, to create this popular wedding tent style ceiling canopy the voile is attached at both sides of the room creating a complete cover. 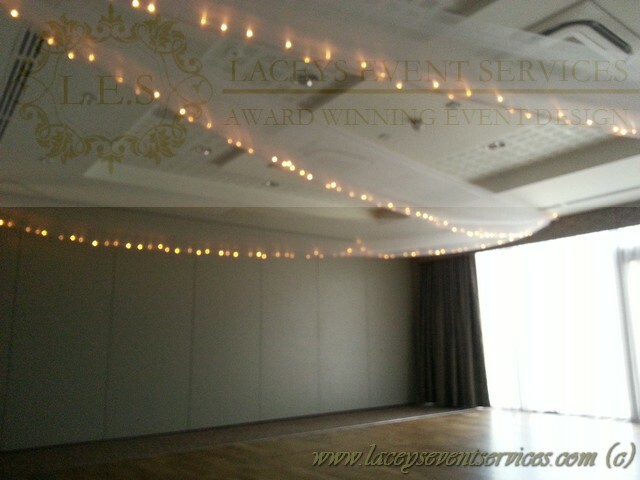 Fixings need to be in place (Or we can add them if advised in advance) for us to run wires down the length of the room and both sides. Another option for a full coverage canopy is similar to the Fan Style Ceiling canopy mentioned above. 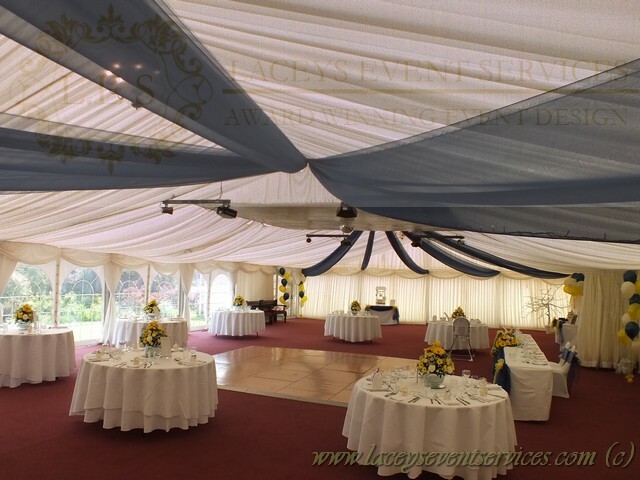 This option is not so suitable for weddings or events where venue hire is for one day only due to the amount of time it takes to set up. 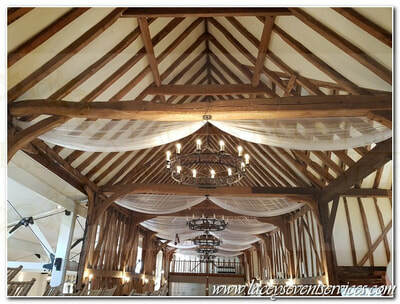 Fixings are made at the centre of the room from where the canopy starts and all the way around the outer edge creating a full bellowed look. 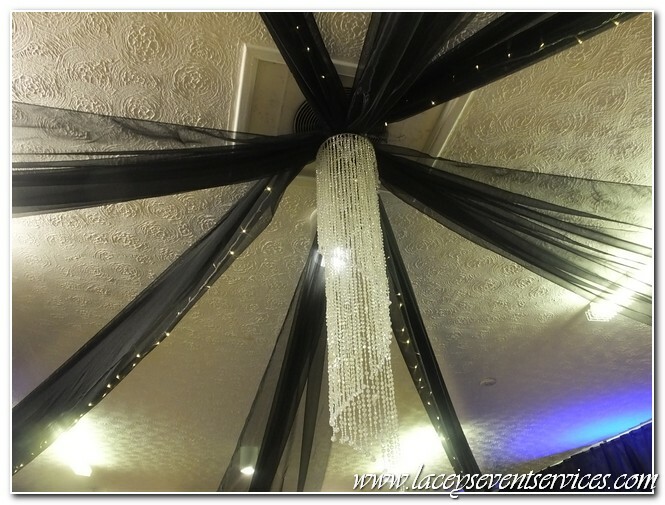 Why not add a Beautiful silk rose pomander or luxury sparkling crystal chandelier to the centre-point of your ceiling canopy! 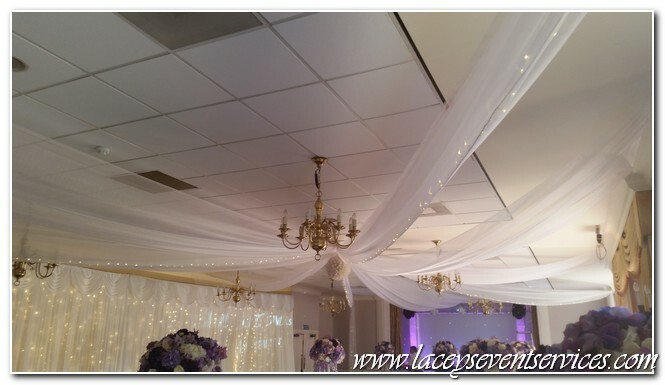 Please Note: Ceiling canopies are not free standing and will either need to be tied to venues existing fixings or by staple gun. We are happy to come and put discreet fixings in place to suspend canopies at time of set up however this will need to be advised to us at time of booking. 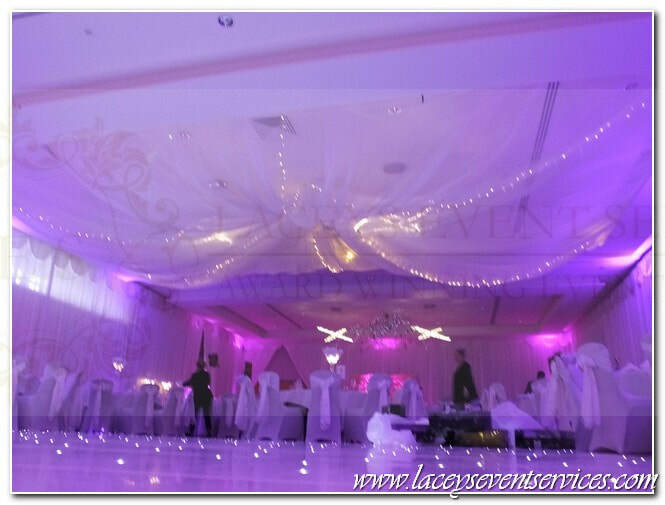 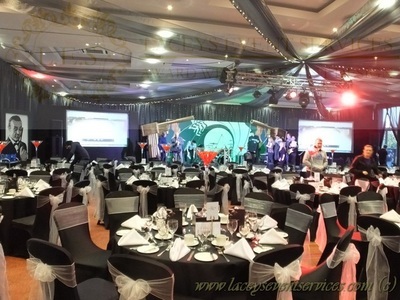 A site visit is undertaken by our company for each new venue booked where we deem necessary. This will be arranged by us directly with the venues and a floor plan and risk assessment created on the visit. 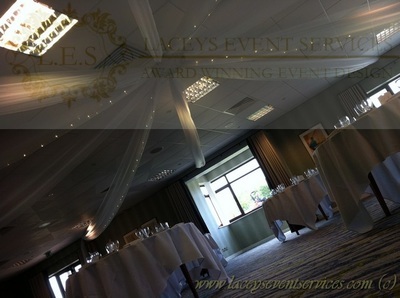 Any discrepancies in room dimensions and/or available fixings will be updated onto the order and relayed back to you. 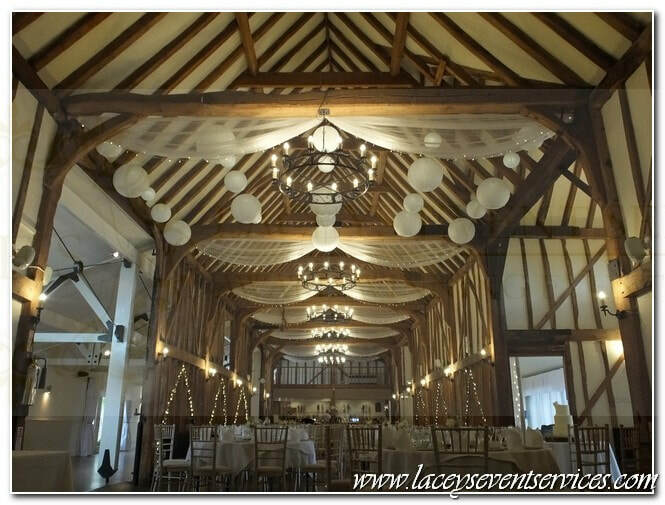 It is the responsibility of the hirer to check with the venue for approval of any fixtures and fittings of ceiling canopies prior to booking. 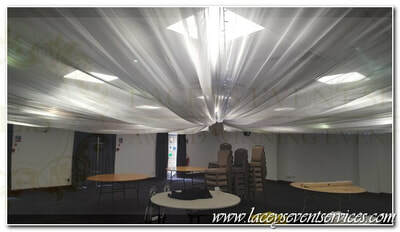 If no restrictions are advised we will assume none are in place and attach in the best way available. 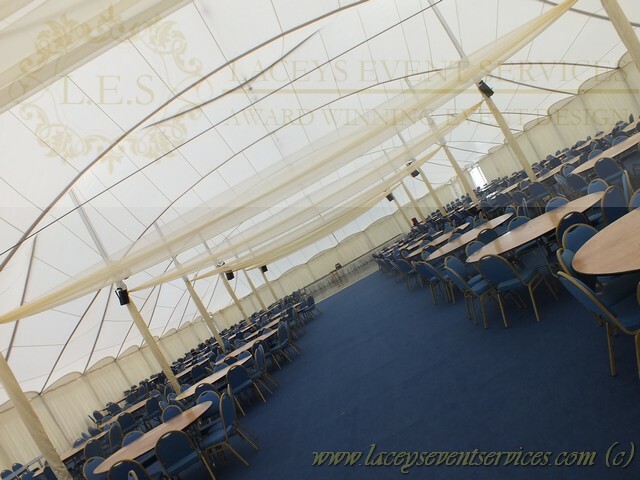 plus PASMA & IPAF qualified. We have full public liability in place for £10m which can be presented upon request. High House Chinese Paper Lantern Canopy Hire, Braxted Park Ceiling Canopy Decoration, Birchwood Golf Club Drapes and Ceiling Canopy, MICA Centre Mersea Island Ceiling Canopy, Pontlands Park Ceiling Drapes, Theobalds Park Wedding Ceiling Canopy, The Arlington Ballroom, Wedding Ceiling Drapes, Woolston Manor, Crowne Plaza Five Lakes Ceiling Canopy, Devonport House Greenwich, Mangapp Manor Lantern Canopy, Ye Olde Plough House Ceiling Swags, Stoke by Nayland Ceiling Drapes and Stoke by Nayland Ceiling Swags, Tewin Bury Farm Barn Ceiling Decorations Beams.